I love to cook and I love cookbooks and I love reading. I belong to a book club -- it forces me to read books that I would not normally read and surprisingly, have enjoyed them all. 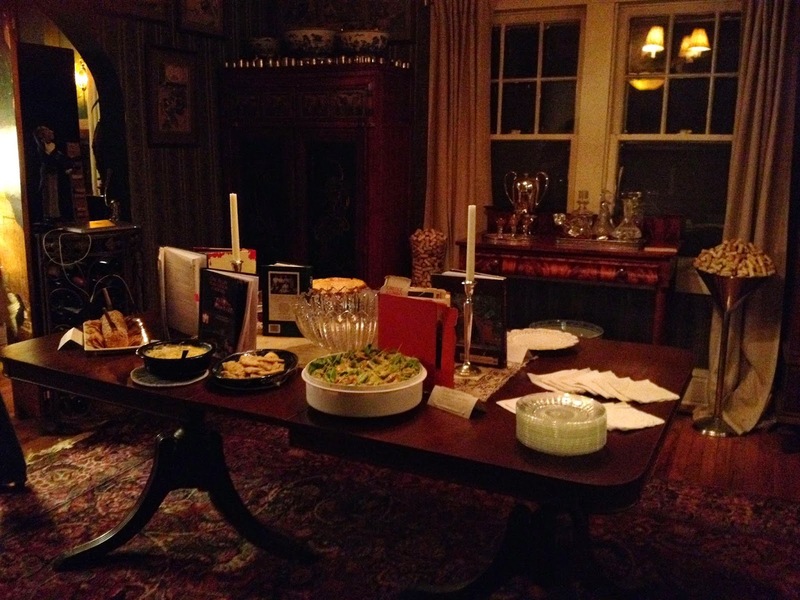 This book club meets monthly and discussion is lively and there is food. Everyone brings a little nibble (or sometimes a member will bring a big nibble!) and we "nibble" and then discuss. It's fun. But . . . I decided that it would be even more fun, if the book was a cookbook. So I posted on Facebook about a Cookbook Book Club. Open invitation to anyone interested, to come to my house, bring an appetizer and the cookbook that it was from and that we would organize the Cookbook Book Club. 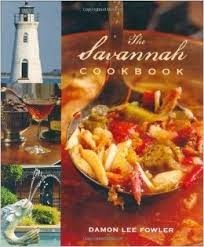 Savannah Cookbook by Damon Lee Fowler. An author that I like not only because of the recipes inside but also because of the history of the cuisine and the dishes inside. It's a readable cookbook and those I prefer. Ones that you can read besides just cook from. 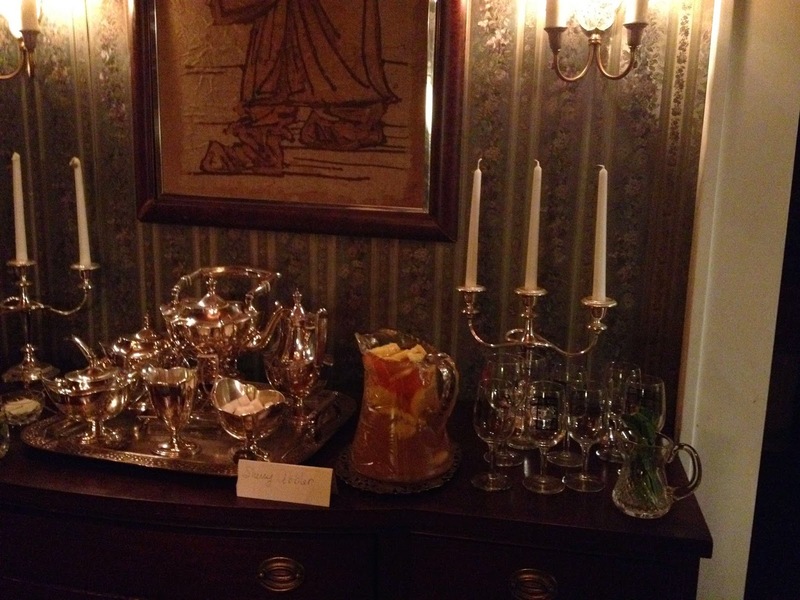 An appetizer, of course, but then also a beverage . . . .
Sherry Cobbler on the sideboard with sprigs of mint to tuck in. A concoction of fruit (oranges, lemons and pineapple (real --not canned), sugar, water and sherry. It's not a lethal punch and the word "cobbler" says Mr. Fowler in the 1800s referred to beverages like this -- not a one crust deep dish "pie". It got thumbs up and I was left with an empty pitcher. We asked everyone to bring the cookbook that the recipe was from and we set the dining room table with the dishes with the books propped behind. We each got a plate and sampled. 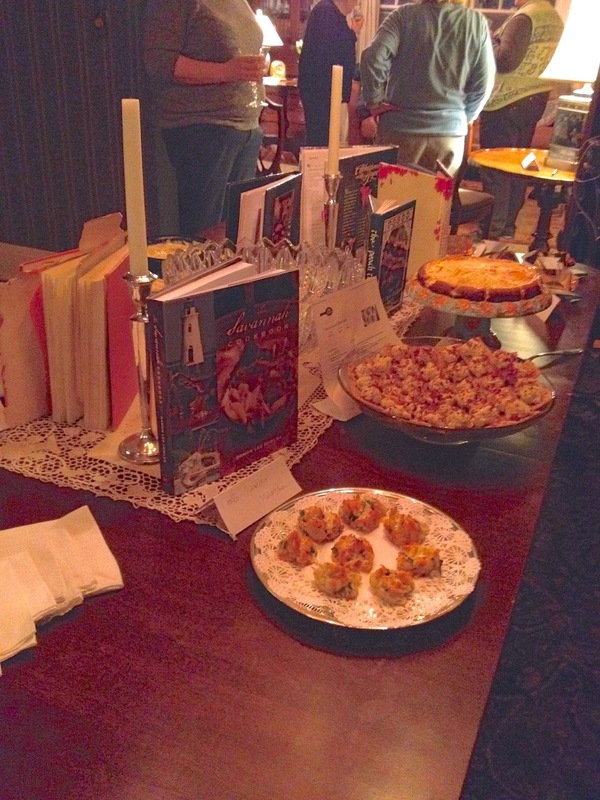 Then we got another plate and grabbed our book and then discussed the dishes, the books, the recipes. Everything was a winner! And almost all were from Southern cookbooks! 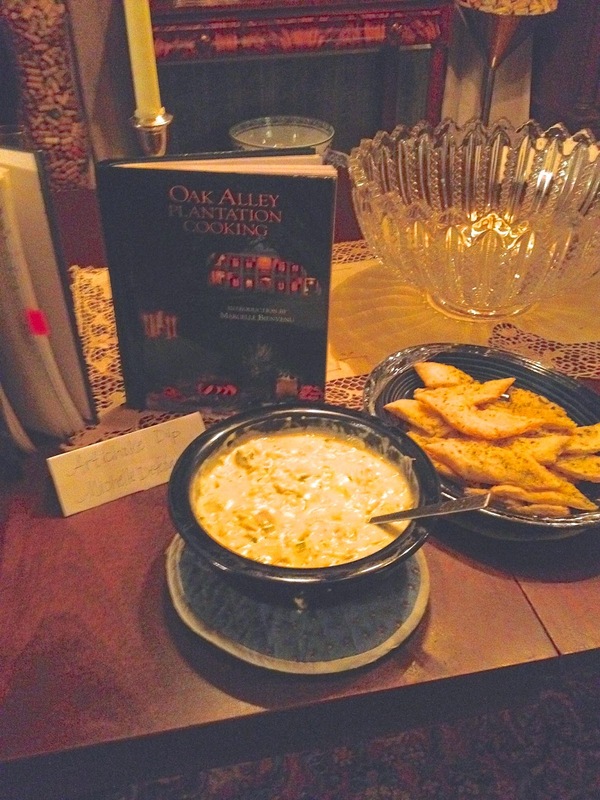 A Spinach artichoke dip from the Oak Alley Planation Cookbook served with toasted pizza crusts! Delicious! And made differently because it contained no cream cheese! Friend Michelle's contribution! A goat cheese cheesecake. Friend Jacki's contribution. It was yummy and the flavor of the goat cheese was not pronounced. For those who have "goat cheese" issues, the group decided that you could call it a savory cheesecake and leave out the word "goat"! Bacon ranch cheeseballs. Made into little balls and served on crackers. We thought the balls were very good but thought the presentation was really clever. 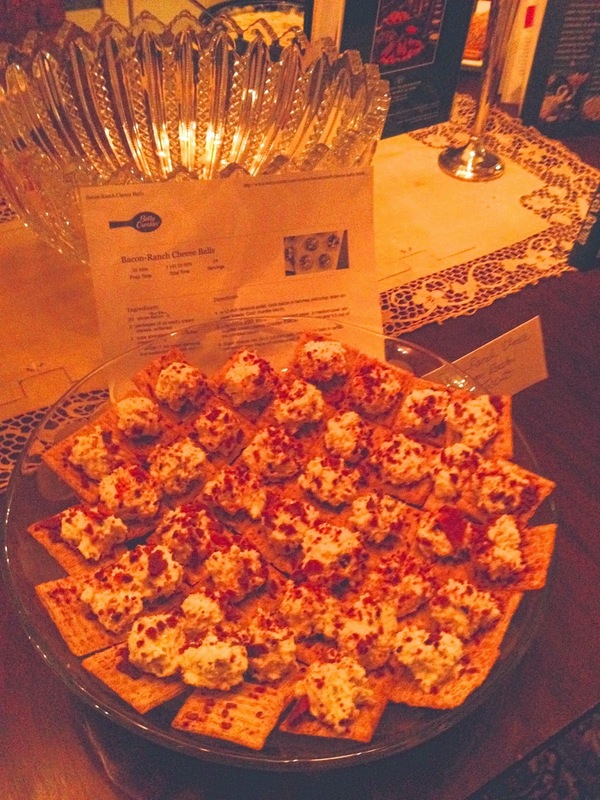 I think you'll be seeing that type of appetizer (tiny cheese balls on crackers) at many a party really soon. Friend Donna brought these. My contribution -- crab tassies. I was intrigued by a savory tassie. I love the pecan ones and make them often. They are really good tea treats. I also have a lemon version that is almost as good as the pecan one. Now I have a savory version. I splurged on crab with a "c" and bought the claw meat. You could tell! 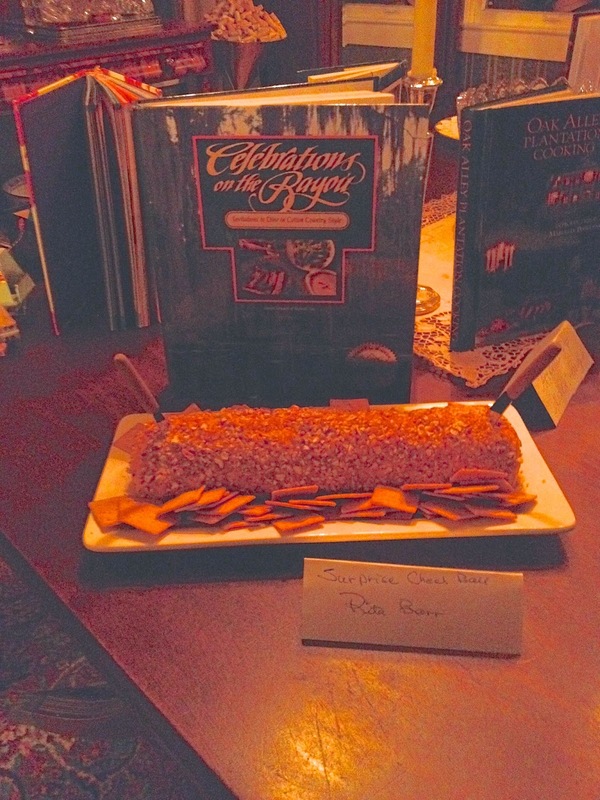 Friend Rita brought a surprise cheese ball made into a log (which is a great presentation we felt -- much better than a ball) -- what makes it a "surprise" -- the mashed sweet potatoes! No one could taste them but we all felt that the cheese ball was much creamier because of that addition. From a Junior League Cookbook (one of my favorite kinds) from Monroe, Louisiana. Friend Darlene, a New Orleanan, brought shrimp (not Gulf -- but we're a little far from there to have Gulf shrimp readily available) with a Remoulade Sauce from Galatoire's in New Orleans. From a cookbook that she helped author. A beloved, well used cookbook! We visited, we ate, we discussed and we visited some more. It was a fun evening. 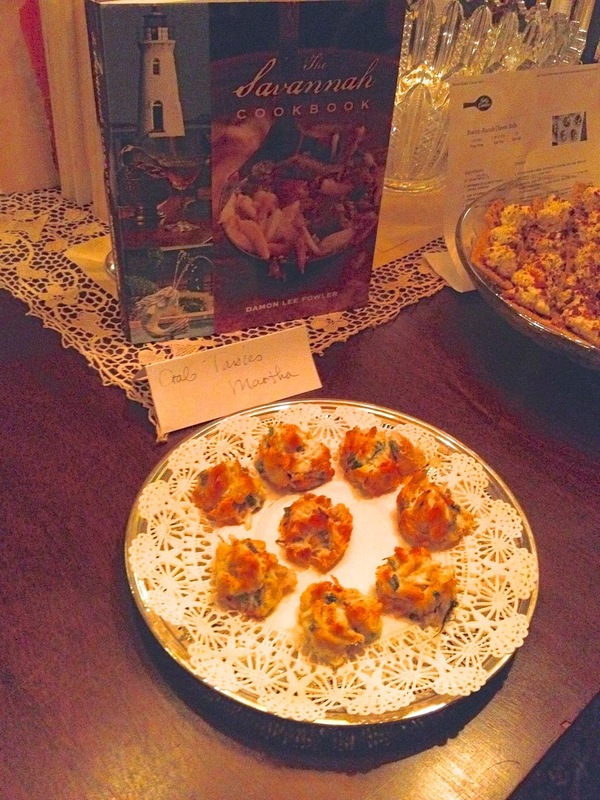 We organized the club, signed up for hostess duties and decided that the hostess was in full control as far as what cookbook/author/theme that we would do the month that she's hostess. 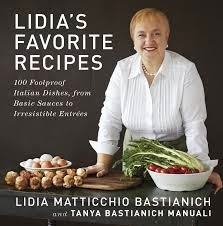 And we'll be cooking with Lidia! I've never cooked one of her recipes although I do watch her sometimes on PBS and I've eaten several times at her restaurant in Kansas City. So I'm anxious to cook with her. My contribution for the next meeting -- the entree! Like the book club, I feel that I will stretch my horizons by using books that I would never have. And isn't that what any type of book club is supposed to be? An opportunity to broaden one's horizons! Cream butter and cream cheese in the bowl of an electric mixer fitted with flat paddle. Stir in flour and salt. Roll into 24 small balls and chill for 1 hour. Press into mini muffin tins, about 1-3/4” diameter. Mix crab with remaining ingredients except paprika. Spoon into unbaked shells, sprinkle with paprika and bake at 350 degrees until golden, for approximately 30 minutes – less if using convection. It's Friday and I'm joining Michael at Rattlebridge Farm for Foodie Friday. There isn't anything more Foodie than a Cookbook Book Club! What a neat idea and a great party. 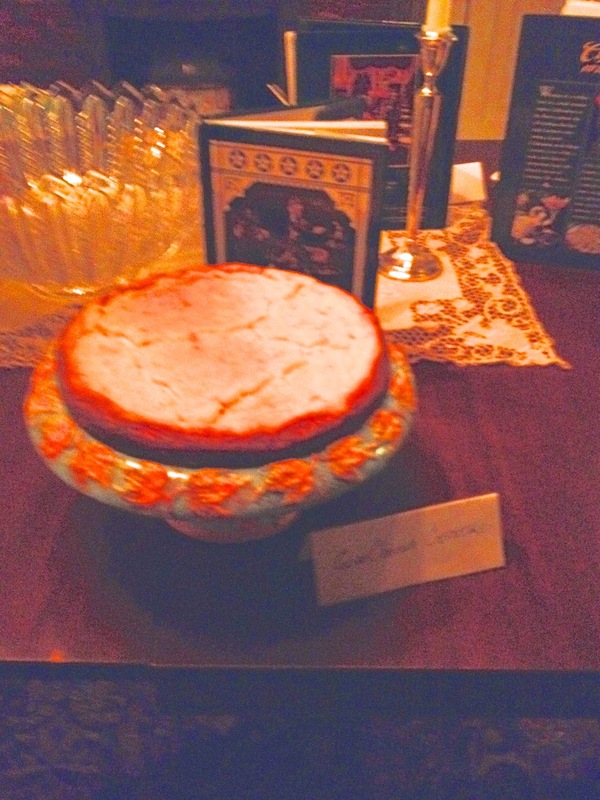 I'm going to look up the Savannah cookbook.Looking forward to seeing the goodies at your next meeting! I love the idea of a cookbook club! Sounds like so much fun! I've had a really good catch-up on your recent posts Martha - you are such a busy lady! Thank you for the recipe for the Crab Tassies. Crab is on special this weekend here, by coincidence, and the Tassies would be a real treat. How fun is that! I love this idea. Thanks for sharing as always. Anonymous -- they are amazing. I DID, however, have some leftover crab mixture. Put it in the fridge and topped toasted bread rounds with it for a "come by for drinks before we go out to dinner" nosh. It's a GOOD crab mixture! Using, of course, "C" crab! Martha, you clever girl! What an idea! I would like to organize something like this with some of my friends...if I can come up with enough of them that enjoy cooking. Martha next time u are in Costco look I the freezer...they have shrimp from the Gulf. Definitely different taste. What a great idea the new club I have the Fowler book and Lydia's...fabulous both. Why don,t we live closer?! That anon was me, lindaraxa but from a dumb iPad! A Reminder of Spring . . . The Magical City of Scott . . . .
You Can Tell It's January . . . .